It has been a while, but here's a recap of our latest WHO/digital year. 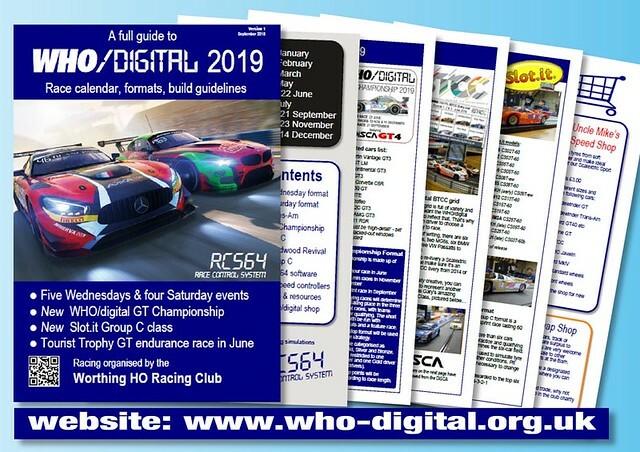 2018 was the fifth season of Scalextric digital racing in Worthing. It started back in 2014 as a fun add-on to our HO club, but now occupies 50% of our annual racing time. Over the past couple of years we have added Truspeed wireless controllers to our kit and switched from SSDC to RCS64. The classes and formats have evolved and we have attracted many new digital racers. For the 2018 season, we separated our Wednesday evening classes and Digital Saturdays, running different classes and formats at each. All five WHO/digital Wednesdays were done and dusted by the summer - our 2018 Nascar club car team race and Trans-Am pairs champions crowned in July. If the Wednesday evenings remain an action-packed and accessible introduction to digital racing, the Saturdays have started down a path to more full-on and nerdy racing. To begin with, there is necessary compromise, but in 2018 we structured our Saturdays around a British Touting Car Championship (BTCC) simulation - three short races, success ballast, option tyres and weather. Between the three BTCC races, we had a club car rotation, Goodwood Revival race and GT endurance team race based on the DiSCA GT4 Trophy rules. In June, the evening was set aside for a long Tourist Trophy team race for Slot.it Group C cars - the first sight of performance chassis in our digital racing.